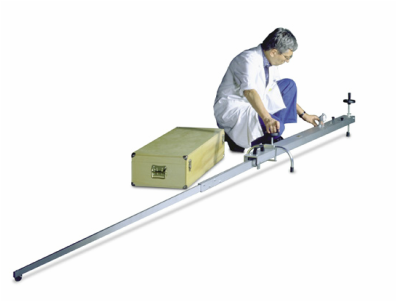 The apparatus is used to measure the deflection of flexible pavements under the action of moving wheel loads. In operation the beam is placed between the tyres of the test vehicle and in contact with the pavement. The deflection is measured as the vehicle passes over the test area. The probe is 2440 mm long and the back extension is 1220 mm. Manufactured in aluminium and chrome finished metals.